Rohini Jha: Happy Teacher's Day! 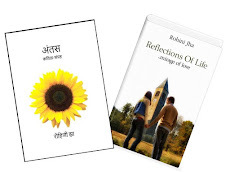 Buy 'Reflections of Life' and 'Antas' online on Amazon Kindle and online stores Amozon.in and Flipkart.com. Books for readers of all ages. Teacher's Day: Celebrating a day dedicated to those who exist just to show the right path to others. What is a teacher's job? In my view, a teacher's job is to show one the right direction; to move ahead on the same is the learner's choice. It is said that you can take a horse to the river but cannot make it drink. Similarly, building upon the basics taught by a teacher depends on the student in entirety. I believe a good teacher is the one who tells his disciples where to look, what does the student find at that place again depends on the pupil. In this era, when information is available on the click of a mouse, I feel that the responsibility of a teacher is to inculcate ethics in the students. If teachers are able to sow the seeds of the right moral values in the young generation properly at the correct time, we can surely uproot several vices from our society and bring up morally more responsible citizens in future. Wishing all a very happy Teacher's day! Can't we act a little more responsibly? Just smile- and let the world guess! © 2018 Rohini Jha. Powered by Blogger.